Michael Reinsch, a journalist from the Frankfurter Allgemeine Zeitung, a nationwide daily newspaper, was initially denied an interview with the Hessen Athletics Association on the grounds of a gagging order. A limited press session was later agreed with the attendance of Thomas Kurschilgen, sports director of the Deutscher Leichtathletik-Verband (German Athletics Association), to dismiss the rumours. Drop Caps are automatically set to all Single Posts. They can also be applied manually. Using the same class to which you can adjust its styles. Block uses the default GeneratePress button. And can be styled from the customiser. Block uses a Full width header & navigation with a contained inner container. The inner container is limited to the same width as the body inside article of 36em on all pages. Primary Navigation matches the Header for Full width and inner content contained and is also limited to 36em wide. Navigation Search has also been enabled. Additional CSS has been used to position the Navigation around the logo. The menu assigned to the Primary Navigation is a blank menu. That is it contains no menu items. This is to stop the horizontal menu from auto-populating on Desktop. Secondary Navigation is also set to the same containment as the Header and Primary Navigation. Additional CSS has been used to fix this to the bottom of the Page Header. And apply a border-top. The menu assigned to the Secondary Navigation is currently a list of post categories. Slide out navigation has been set to default on Mobile. Additional CSS has been used to create the unique centre drop down effect. It also contains a Widget for the Lightweight Social Icons. The menu assigned to the Slide Out Navigation is also the categories list. You should add any pages to this menu. Please note the ‘home’ page label has been assigned an image which is the site logo. And carries the same .site-logo class. Blog and Archive Posts font colours and sizes are controlled by the customiser. Additional CSS has been used to apply element specific backgrounds and borders. Below you will find a guide to the CSS selectors required for restyling. 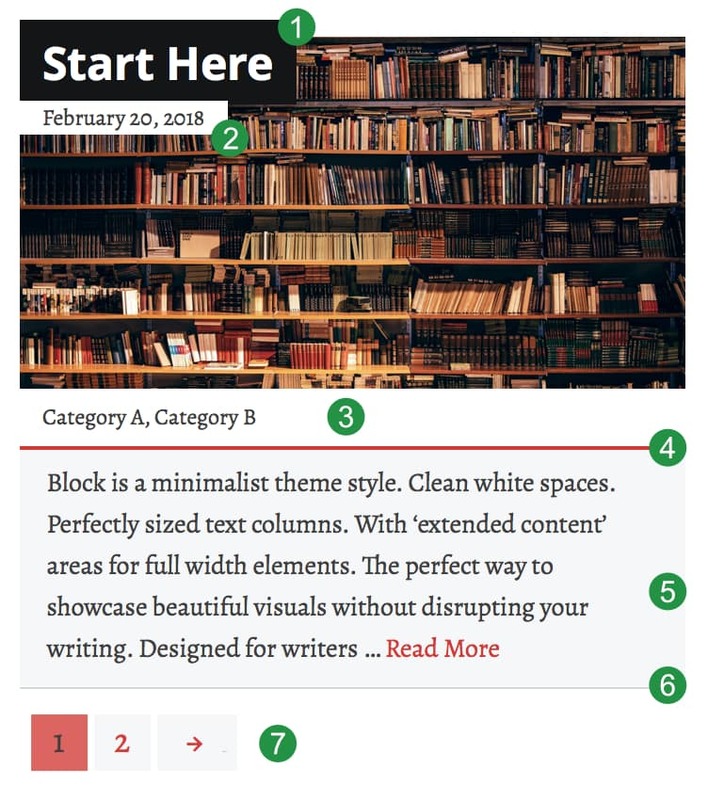 CSS has been applied to create the unique style of Block. Below is the hierarchical index of that, as listed in Additional CSS. The typical change requirements such as fonts and colours have been listed first. CSS below them are generally layout options and should not require adjusting. Please note that the Blog / Archive pages uses CSS Grid. Blog Page > CSS Grid (beware there be dragons), element padding and hide icons.